POVCOMP 2004: Viewing Page for "A Bat in the Belfry"
A creature of the night, a bat, takes refuge in the house of eternal light. Is he a spy for the devil, or just a weary traveler looking for a place to rest? 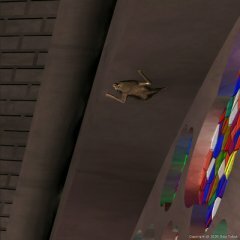 Dwarfed by the immense cathedral, a bat clings to the wall of the nave. He watches a candle lit procession filing past a hundred feet below, who in return are unaware of the bat's pretense. The bat has sought shelter here for the day, yet the morning sun is already starting to pour light through the stained glass windows. Sunbeams pierce the cathedrals atmosphere and the windows glare on the reflecting marble floor. Once past the conceptual states, work started with modeling the cathedral and other objects. Rhinoceros was used for all of the modeling work. The only exceptions are the monks, which are imported from Poser. The cathedral is roughly based off Chartres in France. I embellished a bit more on the masonry instead of creating mural stained glass scenes, however. Half a nave section was modeled in detail and then mirrored to produce the other half, and mirrored across the hallway to complete a full section of the nave. These sections were then copied to produce the length of the nave. This creates a detailed repeating model with little expense to the memory. 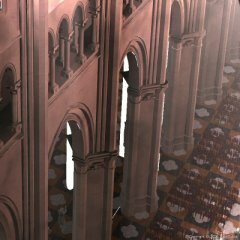 The first month of the contest was spent modeling the cathedral. 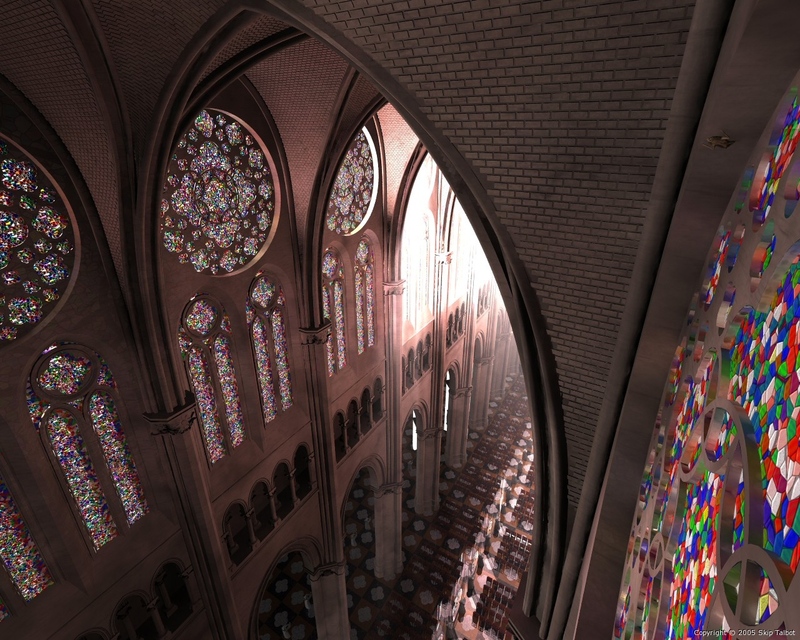 The stained glass is made of a flat box spanning the length of the nave with a layered crackle pattern. The lead framework is an isosurface that uses the same crackle pattern as a pigment function. Double_illuminate was used to make the glass glow and respond better to the outside light sources. The next area of concentration was the lighting. An area light was used for the bulk of the illumination and to cast the light beams. A constant scattering atmospheric media was used to accomplish this. Another point light illuminates the stained glass on the right side of the image. After modeling the bat, Chris Colefaxs hair growth macro was used to cover the model in fur. The monks are imported from Poser. Each holds a candle that is composed of a double_illuminated cylinder with a point light inside to produce a cheap subsurface scattering. The lights were contained in a light_group to keep them from bogging down the render time of the image. To make the deadline in time the render was split up among several computers and the pieces were combined in paint shop pro and converted to a JPEG. Thanks to the POV-Team for wonderful software and support, and to my friends who dedicated their CPUs to rendering this image. Rhinoceros 2.0 Chris Colefax Mesh Compression and Hair Growth Macros Poser 4 Paint Shop Pro 8 Various hardware included: Pentium IV 3.6, 2.4, 2.0, and 1.8 GHz processors with varying amounts of RAM.